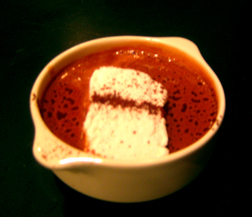 City Bakery's 15th Annual Hot Chocolate Festival sponsored by Valrhona is on until February 28th. The Bakery is featuring a special flavor each day of their signature hot chocolate. Sugary, exorbitant, and gluttonously marshmellowed, it's like downing a bowl of pure chocolate soup. If you're into that kind of thing, it's worth stopping by, at least to find out what all the rave is about. Have you ever tried this? It sounds absolutely heavenly! I've had it. I personally prefer more milk in my chocolate. And I'm not that in to huge marshmallows, but New Yorkers can't seem to get enough of the stuff and the patrons all look very, very happy! wow! I'm so glad you submitted your extra sweet blog to Delightfulblogs. It's just too, too good...I've spent the last half hour reading the posts and ogling the photos. It's a treat and best of all--- no calories!